BUENOS AIRES, Argentina -- As with most industries around the globe, the art world has been taking a hit, as collectors pare down purchases on expensive pieces. About 130,000 people visited the 2009 show considered the most important of its type in Latin America. But in Latin America, there's some light in the art world: affordable art is selling well. 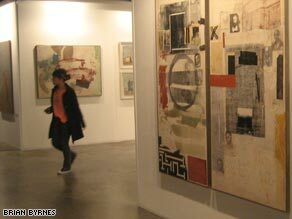 The Buenos Aires International Art Fair -- known as ArteBA -- took place this week and attracted more than 130,000 visitors during its five-day run. ArteBA is considered the most important contemporary art fair in Latin America, and has been increasingly attracting more and more galleries and collectors from around the globe. This year, 90 galleries representing 800 Latin American artists were present. Despite fears that the global financial crisis would hit business, most gallery owners said sales were brisk. "What crisis? My sales have been incredible this week," says Daniel Abate, a gallery owner in Buenos Aires, who was selling works at ArteBA with an average price of $5,000 dollars. "We've made some great sales, some great contacts. So I cannot complain. I think people are more cautious about spending but real collectors are always helping to keep the wheel moving," said Henrique Faria, who runs galleries in Caracas and New York. "If you are a collector and have $1 million dollars to spend on art, when you go to Basel, Switzerland, and with that $1 million you buy, I don't know, three, four, five pieces of art... can you imagine in Argentina what you can do with $1 million dollars for art?," said Abate. Two hundred international collectors -- more than double the amount that attended last year -- visited galleries from Argentina, Brazil, Chile, Uruguay, Venezuela, Spain and the United States at ArteBA. Alejandra Von Hartz owns a gallery in Miami and says that unlike elsewhere in the world, there is no price bubble on Latin American art. "It has never been overvalued. It always has very reasonable prices with respect to the quality and the seriousness of the proposals of the artists," Von Hartz said. The vast majority of the galleries present at ArteBA are from Argentina, but Brazil always has a strong presence, with five galleries selling works this year. Buenos Aires and Sao Paulo have long bickered over bragging rights for the title of 'cultural capital of South America' -- but at least one Brazilian thinks the Argentines come out on top. "Sao Paulo is undoubtedly the regional leader for business, but I must admit that Buenos Aires seems to have taken the lead recently in regards to its cultural and artistic offerings," said Sergio Goncalves, owner of Almacen Galeria in Rio de Janeiro. Artist Lorena Bicciconti is a member of an Argentine art collective known as 36 Veces. Her works were on display at ArteBA for the first time, in an area dedicated entirely to young artists, known as Barrio Joven (The Young Neighborhood). "The people's reactions were incredible. I think it was because of our proposals, which were different and a bit riskier," said Bicciconti. Jorge Mara of the Jorge Mara-LaRuche Gallery in Buenos Aires said the reason art often sells well during times of crisis is that people like to buy things that make them feel good. "People realize that art is a good investment. A double investment: A financial one and a spiritual one," said Mara.